The 74LCXH2245 contains eight non-inverting bidirectional Buffers with 3-STATE outputs and is intended for bus oriented applications. 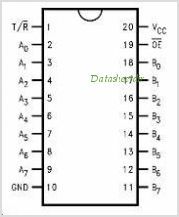 The device is designed for low voltage (2.5V and 3.3V) VCC applications. The T/R# input determines the direction of data flow through the device. The OE# input disables both the A and B ports by placing them in a high impedance state. The 26ohm series resistor in the B Port output helps reduce output overshoot and undershoot. The LCXH2245 is fabricated with an advanced CMOS technology to achieve high speed operation while maintaining CMOS low power dissipation. The LCXH2245 data inputs include active bushold circuitry, eliminating the need for external pull-up resistors to hold unused or floating data inputs at a valid Logic level. This is one package pinout of 74LCXH2245,If you need more pinouts please download 74LCXH2245's pdf datasheet. 74LCXH2245 circuits will be updated soon..., now you can download the pdf datasheet to check the circuits!